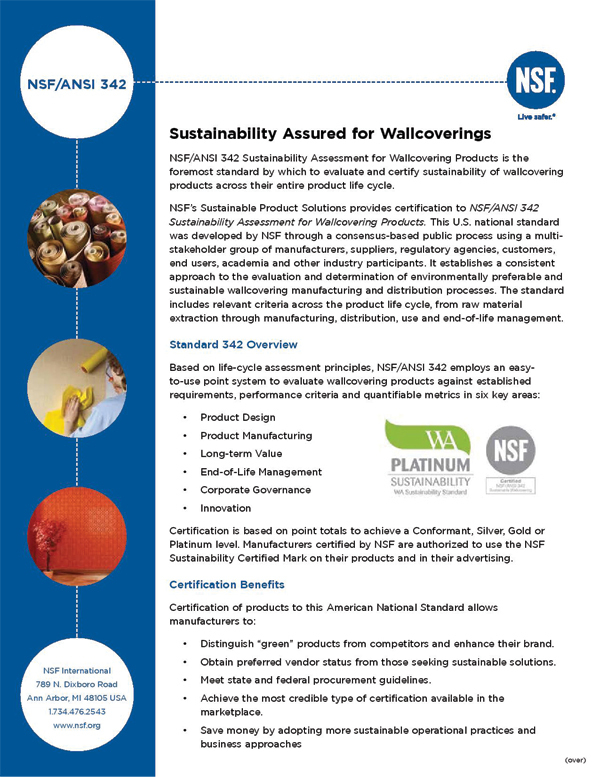 Browse our NSF/ANSI Wallcoverings (above), all eligible for *LEED Credits (FULL product and LEED credit specifications are available for each vinyl wallcovering upon request). *Leadership in Energy and Environmental Design (LEED) is basically a third-party certification program. It is a nationally accepted organization for design, operation and construction of high performance green buildings. This ensures the buildings are environmentally compatible, provide a healthy work environment and are profitable. NEW from LEVEY: Optimus Flair (pictured). Featuring health conscious CleanAir technology. This game-changing technology reduces up to 70% of airborne formaldehyde by absorbing and trapping it within the wallcovering. Digitally printed on glass textiles, our new design Optimus Flair is scalable to any size, and tiles seamlessly to cover even the largest of areas. Durable, making it suitable for high traffic areas, and scrubbable, for ease of maintenance Optimus Flair is also Class A fire rated in accordance with CAN/ULC S102.2 fire safety rating.